What Lessons we can learn! I am determined to make this Monday productive! I am beyond blessed! I woke up refreshed and motivated to be more today. I am feeling so much better, thanks to antibiotics; and I am antsy to be productive today! I hate feeling down and unable to get things accomplished. Too much time to think, plan, wish I was actually...doing! What lessons have I learned from other's errors/mistakes? I think that is a part of life. Everyday, whether it be from our parents teaching us or even something we read about or hear on the news. We are constantly learning about a mistake someone has made. Hopefully, we will learn from them. I see and hear so many stories about mothers or by mothers who have made mistakes. Some may be serious, some may just be an inconvenience but they learned the hard way. I, personally, thank these women. Without them sharing and exposing their mistakes, so many others may never even know the mistakes they are making. I'm honestly not going to say, it should never be done. It is something that I feel can be used as a way to get an immediate reaction, when needed. Although if it becomes the norm or a habit, it will inadvertently cause you to raise a "Yeller". They learn this is the way to get what they want, attention, actions from others, etc. We can do that! It is perfectly okay to say, "No, we just can't do that." or "You can't go." or "We can't afford that." Years from now,(hopefully) they won't be on Dr. Phil because you didn't let them go out with Susie and see that new movie on the same day as the church craft fair you had committed to 6 months ago. 4)Don't buy the kid's meal! It's a trap! I can't speak for every momma, but personally, we have wasted, I'd say $1,000s on kids meals. 3 kids x 19 years of over sized, over cooked, over priced...wasted food that only gets brought home to be forgotten in the fridge until weeks later. They never eat it! My Mamaw always had this saying, "It always tastes better off of Momma's plate." and that is true. 99% of the time, my girls ended up helping me eat my meal, rather than their own. Now this one, I can go both ways. Yes, we need our rest too. It can be wise to rest while they are, but I don't necessarily mean go to sleep. Every day and every momma is different. Some people just can't go to sleep mid-afternoon. Take this time to rest. Do something relaxing you couldn't do with the little awake. Take a bath, read a book, call a friend, drink the coffee HOT, eat the cupcake! I really wanted to keep this post light and non controversial. I hope that you enjoy and maybe learn from a few of my mistakes. 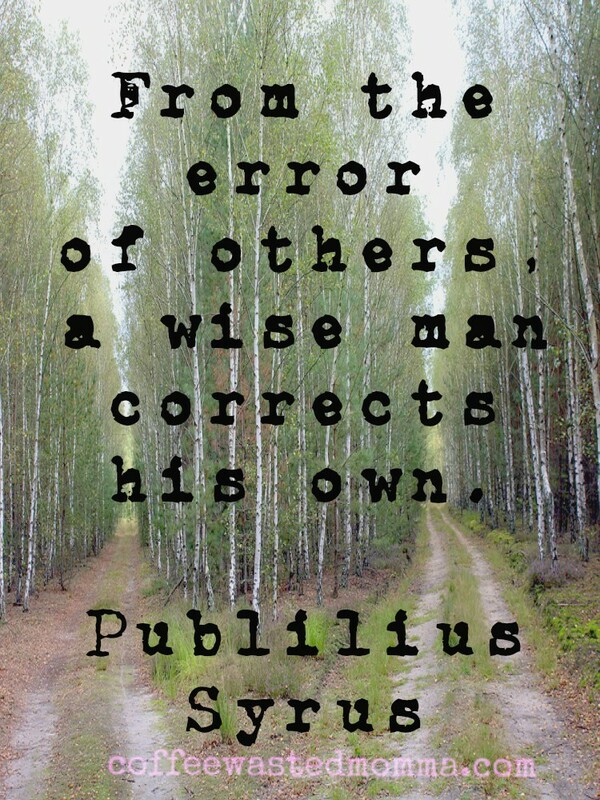 What have you learned from other's errors? 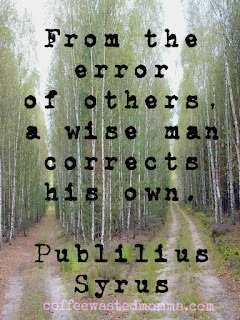 Have you corrected your own? 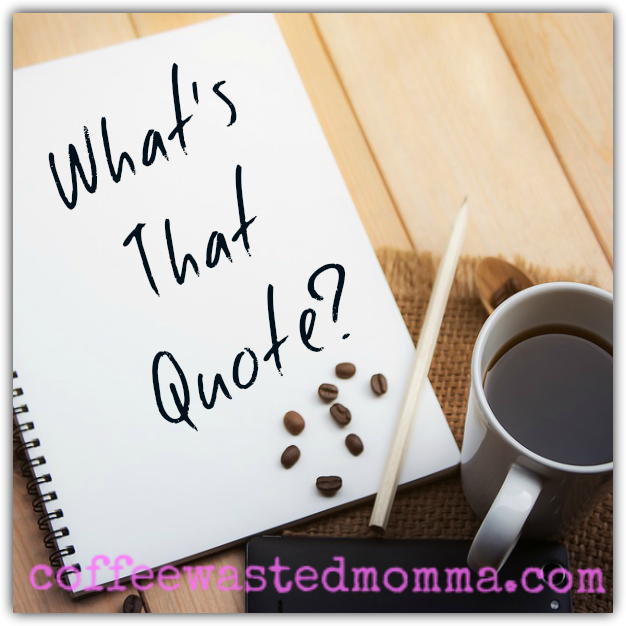 Labels: momma life, momma moment, What's that quote?